Sparks fly. Feathers sizzle. Flames erupt. After five centuries, an ancient bird ignites by its own fire and disintegrates to ash. All is still. Then, a small beak pokes out from beneath the powdery blanket, and the phoenix is reborn. This is the phoenix of the West—a symbol of renewal and second chances. Soar to the other side of the world, though, to the slender bamboo groves and wutong trees of the Orient, and a different phoenix rules the skies. 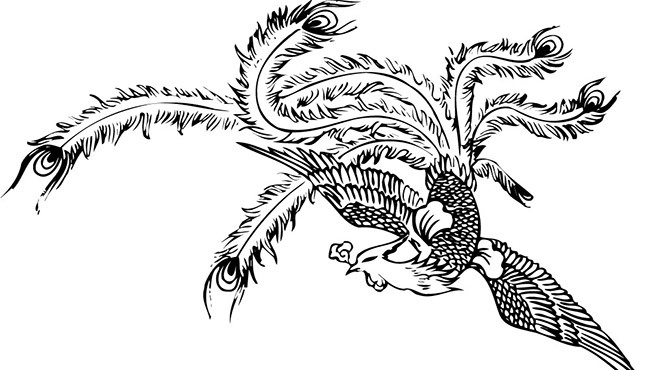 What we know of the oriental phoenix, or fèng huáng (鳳凰), comes from age-old folklore and mythology. Legends praise the feng huang for its abilities to judge character and to bestow blessings on the honorable and kind. Some stories claim that the bird only lands where something precious is to be found. Others tell of its ability to transform into heavenly maidens. With millennia of history under its wing, the feng huang has ruled the roost as a symbol of Chinese culture. The feng huang is one of the key players in Chinese cosmology. 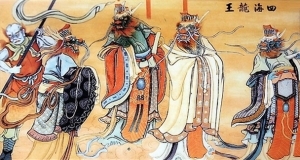 According to Chinese myth, after Pan Gu burst from the giant “egg” of chaos, four other beings followed him into existence. They were the dragon, qilin (a horned and hooved creature), tortoise, and feng huang. These four fantastic creatures, dubbed the Four Spirits, joined forces with Pan Gu to create the world. They used their powers to form the five elements (metal, wood, water, fire, and earth), establish five seasons (spring, fall, winter, summer, and late summer), and divide the world into five regions (north, south, east, west, and center). The beings each took responsibility for a fifth of their creations, with the feng huang commanding fire, summer, and south. 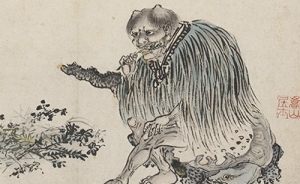 Some legends describe the feng huang’s body as corresponding with the celestial bodies with its head as the sky, its eyes as the sun, its back as the moon, its feet as the Earth, and its tail as the planets. Thus, the bird was regarded as a link between our world and the heavens beyond. Chinese artwork teems with feng huang: they can be found roosting on rooftops, posing on porcelain, or soaring across silks. Artists usually portray them as beautiful, feminine birds resembling peacocks or golden pheasants. 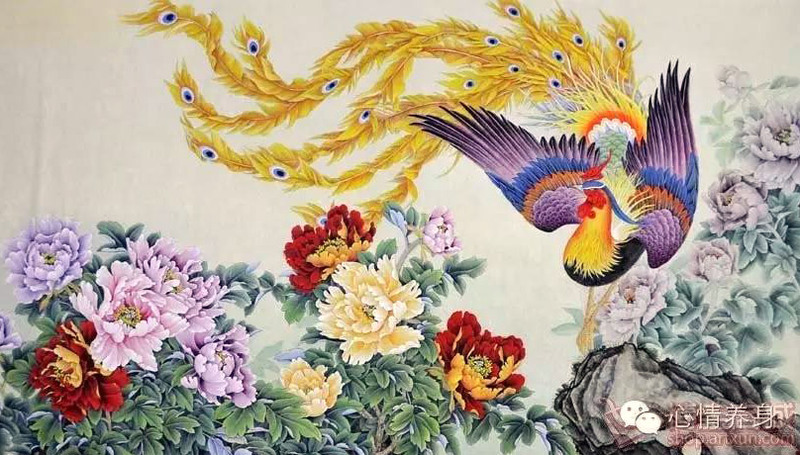 More than just beautiful to the eye, the feng huang’s vivid plumage is composed of the five fundamental colors of Chinese philosophy—yellow, white, red, black, and green—and corresponds with the five Confucian values of benevolence, duty, respect, wisdom, and faith. Therefore, incorporating feng huang in artwork serves the higher purpose of honoring traditional values. This also distinguishes both the artist and the owner of the artwork as people of integrity and refinement. In the earliest times, the feng huang referred not to one bird, but two. Feng was a male bird, while huang was a female. Together, they were a metaphor for the yin and yang symbol, as well as a representation of the solemn relationship between man and woman. Later, feng and huang were combined into a single female bird and often paired with a male dragon. This is the Chinese phoenix most commonly recognized today, and the one that has inspired generations of Chinese people—particularly women. Humble, loyal, kind, and proper, the feng huang embodies characteristics that defined the traditional ideal of a lady. 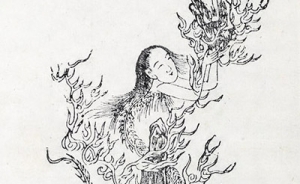 As it emphasizes the connection between the royal family and the divine, the feng huang was also the perfect emblem for the empress and an ideal match for the dragon that symbolized the “Son of Heaven,” the emperor. The feng huang and dragon theme is also popular among the populace. As the luckiest of all creatures, when depicted together, they signify blissful relations, good fortune, and enduring strength. Idioms about the two abound, and usually connote luck or ability. 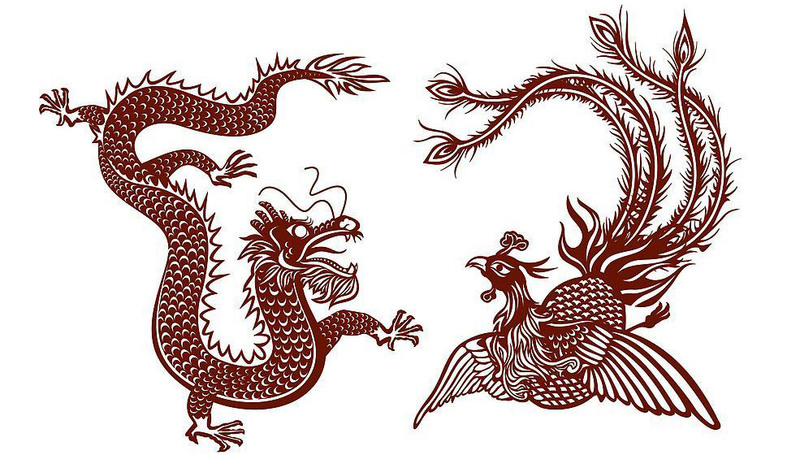 For example, lóng fèng chéng xiáng (龍鳳呈祥) means prosperity so great it must have been brought by a dragon and phoenix, while rén zhōng lóng fèng (人中龍鳳) indicates someone so talented he stands out like a dragon or phoenix among humans. The feng huang aren’t easily ruffled. With their shy demeanor and benevolent wisdom, feng huang withdraw during times of trouble, and reappear to usher in peace. They bestow blessings on those fortunate enough to meet them and herald exceptional events. Sightings of the bird at the birth of an emperor, for example, meant that the child would grow up to become a virtuous ruler—the best blessing for a country. 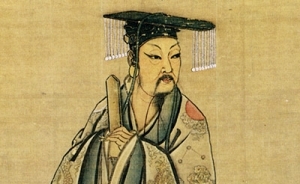 In history, feng huang have also announced the arrival of great sages, indicating the coming of morality and stability. Throughout the dynasties, the feng huang has remained a symbol for the virtuous and wise. And from natural forces around us to traditional moral principles to the heavens beyond, the feng huang connects us all as an everlasting symbol of beauty, grace, and the divine.